Their location,a short ferry ride from Brisbane's Central Business District, offers a window into the geography, history and culture of Brisbane! Challenge yourself to rock climbing or abseiling the Kangaroo Point cliffs or take a leisurely kayak on the Brisbane River. If you are up for some night action, take a night kayak along the river followed by great food, wine and beers overlooking the luminous city lights. Choose from their Friday night paddle and prawns experience or try their Saturday paddle and barbecue. Whatever it is they guarantee to get your adrenaline pumping! No experience is necessary as each session includes instruction, a safety briefing and equipment. Minimum eight years of age and bookings are essential. Take advantage of Brisbane's beautiful weather and explore the city hot spots on your own,hire a bike,kick bike,inline skates or a kayak! They also offer incredible aboriginal cultural experiences presented by the Uggera Aborliginal Dancers. Visit the operator's web site for more details. What better way to explore Brisbane's majestic river than with the Paddle and Prawns experience. Take a leisurely one and-a-half hour kayak up the iconic river with a built-in light on each kayak illuminating the Brisbane River. Watch the city lights shimmer on the water and soak up sweeping views of the city from a unique angle. Finish the adventure with fresh Ocean King Prawns and an assortment of soft drinks, chilled water, Australian beer and wine overlooking the Brisbane River at Riverlife. Bookings are essential. No experience is necessary as each session involves full instruction, a safety briefing (where you will learn how to kayak) and all equipment. Minimum eight years of age! Bookings are essential. Please bring a spare change of clothes (as clothes will get wet on tour), a hat, water bottle and sunscreen. Saturday Night Paddle and Barbecue is a one of a kind adventure - you will discover Brisbane from a different perspective. Experience a leisurely illuminated kayak up the Brisbane River followed by a traditional Aussie barbecue, lamingtons and an assortment of soft drinks, chilled water, Australian beer and wine overlooking the river and the city from Riverlife. No experience is necessary as each session involves full instruction, a safety briefing (where you will learn how to kayak) and all equipment. Minimum 12 years of age! Bookings are essential. Please bring a spare change of clothes (as clothes will get wet on tour), a hat, water bottle and sunscreen. Whether you are a first-timer or an experienced paddler, get out and discover Brisbane's beautiful river city by Kayak! Riverlife's guided Kayaking adventure sessions let you see the city from a unique angle while you glide along Brisbane River! Try the newest craze to hit Brisbane! Be one of the first to experience the exciting new Paddle Boarding adventure Riverlife offers along the Brisbane River. The experienced instructors will teach you the techniques to confidently Paddle Board at your own pace while exploring Brisbane's iconic river. Suitable for all ages, abilities and fitness levels, the adventure includes comprehensive Stand-Up Paddle Boarding information followed by an instructed Paddle Board Adventure. They offer the choice of Kayaking or Stand Up Paddle Boarding for this adventure. Bookings are essential. 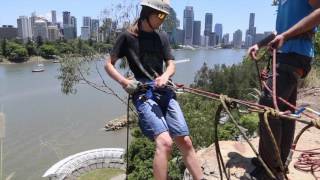 Step off the edge of the Kangaroo Point Cliffs and into a vertical world! Abseiling is the ultimate rush. You will be abseiling down the 20 metre high cliffs in no time... No experience necessary! Riverlife Abseiling sessions are guided by qualified and experienced instructors. No experience is necessary as each session includes instruction, a safety briefing (where you will learn how to abseil) and equipment. Participants must wear and use the safety equipment provided by Riverlife. Safety equipment includes a helmet, harness, rope and gloves. Meet the local Brisbane Aboriginal Tribe Riverlife Mirrabooka and share in rich Aboriginal culture presented by the Yuggera Aboriginal Dancers in the natural bushland of Kangaroo Point. Develop an awareness of the diverse aspects of contemporary Aboriginal culture by witnessing and participating in traditional song and dance passed down over many generations including, discovering primitive fire starting techniques, playing of Aboriginal musical instruments (such as didgeridoos, clap sticks), and listening to Indigenous educational talks that offer an insight into Aboriginal life and history. Since the group's formation twelve years ago, the Yuggera Aboriginal Dancers have performed to audiences in Australia and throughout the world. Already popular with travellers from the United Kingdom and Europe, their audience members range from Queen Elizabeth II to the street children of Asia. Challenge yourself in the great outdoors and experience climbing the lit up weathered walls of the Kangaroo Point Cliffs. Climb to the top of the 20 metre cliffs where you can take in Brisbane's best views of the city and river! Climbs of various levels of difficulty are available to suit everyone - including beginners! Riverlife Rock Climbing sessions are guided by qualified and experienced instructors. No experience is necessary as each session includes instruction, a safety briefing (where you will learn how to rock climb) and equipment. Participants must wear and use the safety equipment provided by Riverlife. Safety equipment includes a helmet, harness, rope and chalk. Experience an awesome night out like no other! Catered for beginners through to experienced Kayakers, enjoy the views as you pass the Central Business District, Botanical Gardens, the Kangaroo Point Cliffs, Southbank and other local landmarks along the River. Discover Brisbane’s golden hour from a different perspective. Enjoy a leisurely 90 minute illuminated kayak journey on the iconic Brisbane River with your friends or family. Take in the sensational city and river views while gliding under Brisbane’s inner city bridges and cutting through the luminous reflections of the city and the sunset on the water. When you return to shore enjoy a shared dip platter and an assortment of chilled beer, wine and soft drinks, served under one of our riverside marquees. Bookings are essential. Join them for laser tag in their arena of parklands complete with plenty of natural cover to shield you from enemy attack. Team up with your red or blue comrades and plan how to dodge enemy fire and take victory from your opponents. A great fun outdoor team activity for all ages.